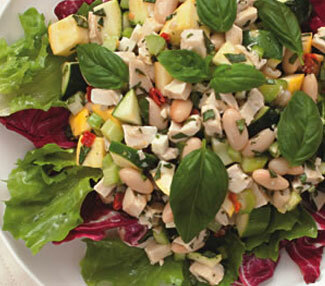 Zucchini and celery give this chicken-and-bean salad a nice crunch. We like serving it over a bed of slightly bitter escarole and radicchio, but any type of salad greens will work. To prepare salad: Combine beans, chicken, zucchini (and/or summer squash), celery, cheese and sun-dried tomatoes (if using) in a large bowl until well blended. Add chopped basil and 3/4 cup vinaigrette; toss until combined. Taste and season with salt and/or pepper, if desired. Toss the remaining vinaigrette with escarole (or romaine) and radicchio in a medium bowl. Serve the salad on the greens, garnished with fresh basil leaves. Tip: To poach chicken breasts, place about 1 pound boneless, skinless chicken breasts in a medium skillet or saucepan. Add lightly salted water to cover and bring to a boil. Cover, reduce heat and simmer gently until chicken is cooked through and no longer pink in the middle, 10 to 15 minutes. Ricotta salata and halloumi are both firm, salted cheeses that can be found at large supermarkets and cheese shops.